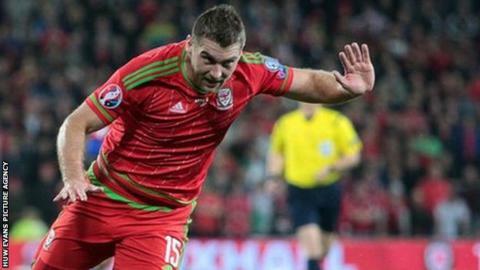 Burnley striker Sam Vokes has withdrawn from Wales' squad for Friday's friendly against Netherlands at Cardiff City Stadium because of a groin injury. The 26-year-old did not take any part in training on Tuesday and has left the squad to rejoin his club. Fulham winger George Williams, working is way back to fitness, has been called up to the squad in place of Vokes. Wales are without fellow forwards Gareth Bale and Hal Robson-Kanu for their first Euro 2016 warm-up match. Bournemouth midfielder Shaun MacDonald has replaced David Cotterill as the Birmingham winger has a knee injury. Tom Lawrence, on loan at Blackburn Rovers from Leicester City, Milton Keynes Dons striker Simon Church and uncapped Tom Bradshaw of Walsall are in the squad. Wayne Hennessey (Crystal Palace), Daniel Ward (Aberdeen, on loan from Liverpool), Owain Fon Williams (Inverness Caledonian Thistle). Ashley Williams (Swansea City), James Chester (West Bromwich Albion), James Collins (West Ham United), Ben Davies (Tottenham Hotspur), Chris Gunter (Reading), Neil Taylor (Swansea City), Adam Henley (Blackburn Rovers), Paul Dummett (Newcastle United). Joe Ledley (Crystal Palace), Joe Allen (Liverpool), David Vaughan (Nottingham Forest), Emyr Huws (Wigan Athletic), Jonathan Williams (Crystal Palace), Andy King (Leicester City), David Edwards (Wolverhampton Wanderers), Shaun MacDonald (Bournemouth). Tom Lawrence (Leicester City), Tom Bradshaw (Walsall), Simon Church (Milton Keynes Dons), George Williams (Fulham).